Now that both Interstellar and The Hunger Games: Mockingjay—Part 1 are out in theaters, there’s not a ton of new science fiction coming to your local cinema before the end of the year. Right now the main focus is on prestige pictures and getting those films onto screens so they qualify for the various end-of-the-year awards. Fortunately we don’t have to wait too far into 2015 to get our first dose of sci-fi, as the Spierig Brothers’ fantastic Predestination drops on January 9, and now you can watch the first seven minutes of the film here. I like this move because this extended clip from Crave Online gives you a better feel for the movie than any of the trailers we’ve seen up to this point. 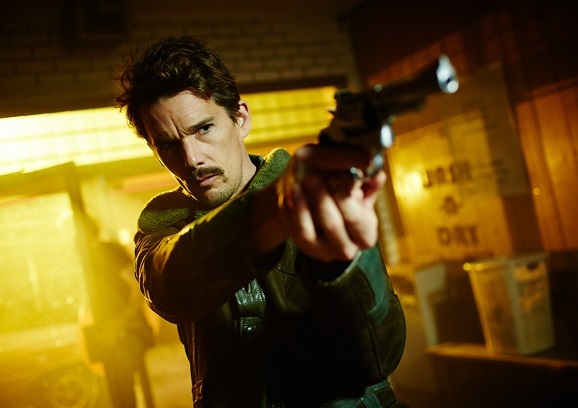 January can be a dead zone where studios dump movies that didn’t turn out as well as hoped, but if you think that’s the case with the Ethan Hawke starring Predestination, you’re wrong. The film is quite good, but it simply feels like they’re not sure how to go about selling it to audiences, and that’s a fair problem, because this is a very unusual movie. Based on Robert Heinlein’s short story “All You Zombies,” (which you can read HERE if you like), Hawke plays a Temporal Agent, a kind of cop who jumps through time to stop crime before hit happens. On his final mission, he tries to stop the one criminal who has always eluded him, the so-called Fizzle Bomber. Thus far, the marketing has made this seem like another Minority Report or TimeCop, but it is decidedly its own unique thing. You’ve never seen a movie quite like this. There’s not a ton of action, it’s more of a twisting, continually shifting genre thriller that circles back on itself in new, interesting ways. It also features great performances by Hawke and Sarah Snook, who, if there’s any justice in the universe, we’ll be hearing much more from shortly. Predestination recently gathered nine nominations at the Australian Academy of Cinema and Television Arts Awards, leading the pack. Russell Crowe’s directorial debut The Water Diviners was second, with eight, while The Rover picked up seven. The Spierig Brothers’ (Undead, Daybreakers) latest earned nods in best film, best lead actress, best direction, best adapted screenplay, best cinematography, best editing, best original sound, best production design, and best costume design, and deserves to be recognized in any of those categories. You really should go see Predestination when it opens January 9, it’s definitely one that’s worth your time, and hopefully this quick look is enough to pique your interest. If not, I’m sure we’ll be back before the film opens to plead its case again.